I don´t really know what to say about this movie. Basically I think it is a missed chance. It contains too many flaws to be really good but still has quite a few touching moments. One would like to grab the filmmaker and give him a good shaking because it would not have needed much to be satisfying. 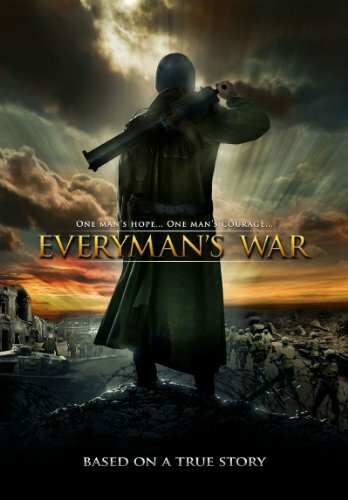 Everyman´s War is based on the story of Thad Smith´s, the film director´s father. Sgt. Don Smith was part of the 94th Infantry Division fighting for Nennig, a small town in Germany during the Battle of the Bulge. The Battle of the Bulge was one of those notorious big battles that had to show up with an enormous cost in lives. Being one of the decisive battles, the last big Nazi offensive, it overshadows other battles like the one at Hurtgen Forest that was so skillfully depicted in When Trumpets Fade. The battle of Bastogne Forest that we saw in Band of Brothers is also part of the Battle of the Bulge. Smith lands in Europe around Christmas 1944, just when the offensive begins and stays in Europe until the end of the war. The tragedy of the battle is well shown in Everyman´s War. The Army command misjudging the German´s will to fight thought they would never attack during ice-cold weather, snow and temperatures below zero. But they did. Sgt. Smith´s courageous fight, the love for his comrades and his despair about losing them is well shown. So are the battle scenes. As long as there is no music all is fine. Sadly the choice of music is bad and ostentatiously corny. And so is the background story, the home front bits (think the end of Saving Private Ryan and dip it in sirup). This is frustrating as the main theme, alluded to in the title, is nicely executed. This was everyman´s war. Everybody was in it. The French, the English, the Americans, but also the Germans and the German Jews. Moments where the film achieves to make us feel sorry for everyman involved are truly good. One last word on the use of language that will only annoy people who understand German. 90% of the actors impersonating German´s are not Germans and have bad accents and an unintentionally funny way of pronouncing the German words. However this will not bother speakers of other languages. Apart from that the portrait of Germans is quite just. Having said all this I just think it is a pity. This could have been a good film but now we are left with a 3 (out of 5) star achievement. To determine who is your favourite war movie character is a very, very subjective thing. At least for me. No objectivity here. It is neither linked to the fact if I do consider the movie he´s in to be outstanding or average, it doesn´t say anything about the acting in itself, I really only think of the character. And, yeah well maybe it has something to do with the fact that the role is played by one of my favourite actors. What I loved about this character is his goodness. In all the horror that surrounds him, he stays good. Nothing compromises him, nothing turns him into an inhuman being devoid of feelings or compassion. And in the end he doesn´t shy away from sacrificing himself. He is the ultimate war movie hero, hero through his sacrifice not through his killings. And yes, I alluded to him in another post (Christ and the War Movie Hero). My favourite character is Sgt. 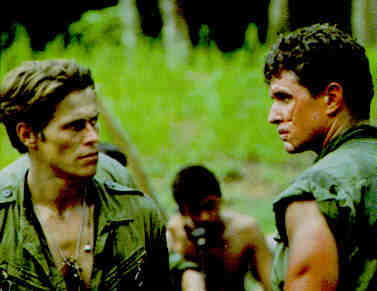 Elias (Willem Dafoe) in Platoon. 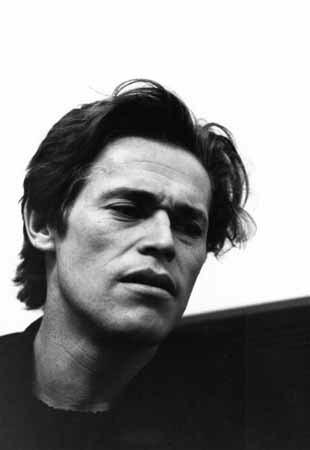 And yes, I´m sure it´s no coincidence that he was later chosen to play Jesus Christ in The Last Temptation of Christ. He´s been my favourite for many years now and I only wavered once, after having seen When Trumpets Fade where we see another sacrificial hero. Eerily beautiful is what comes to mind when speaking about this overlooked war movie gem. I discovered it thanks to Gary Freitas’ book on war movies. The movie starts with black and white original footage and a voice telling us that it is 1944, just after Paris has been liberated. After this introduction we are thrown into action and see one soldier, private Manning (Ron Eldard), carrying his mortally wounded comrade whom he finally must abandon. All through watching this movie I was reminded of Goethe’s ballad the Erlkoenig in which a father rides with his son through the woods at night. The child keeps on saying it sees the Erlkoenig in the darkness who tries to tempt him and take him away. A very spooky ballad. When the father finally arrives at his destination he finds out that his little son has died in his arms. Maybe John Irvin, the director, did think of this ballad when he shot this movie. The woods always had a special place in German mythology and references to this can be found in many a movie or book about WWII. The soldiers in this movie are fighting a senseless battle, one that cost a horribly high amount of lives. The battle of Hurtgen forest is only not spoken about so often since it was shortly followed by the more famous Battle of the Bulge. When Trumpets Fade tells the story of private Manning the only survivor of his company who is – due to his ability to survive under such circumstances – promoted to sergeant and gets to lead a group of replacements. In a bloody battle where they are to secure a bridge he is again one of the only survivors and gets promoted to lieutenant. Both times he protests. All he wants is to survive and get out. He’s not the only unhappy soldier. The battle seems sense- and fruitless, casualties are high, soldiers and officers complain and rebel. Manning is a very interesting character and his development makes this movie one of the rare psychologically interesting of its kind. This and the eerie scenes in the woods where the fog is thick, Germans lurking everywhere and naked, burning trees stand lonely and dark against the background, makes this a haunting experience to watch. The final credits are shown over endless rows of dragon’s teeth that are slowly covered in snow to Bing Crosby singing White Christmas. People did talk about Saving Private Ryan. They talk about it and they will continue to talk about. 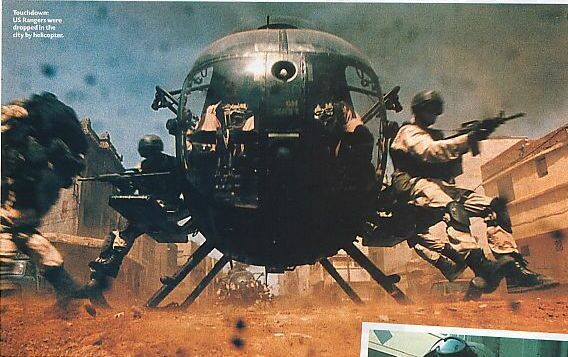 Occasionally it seems that it is the only war movie that has ever been made. At least the only one the general public is aware of – until, of course The Hurt Locker got the Oscar – but that is another story and if I believe it deserved it…). 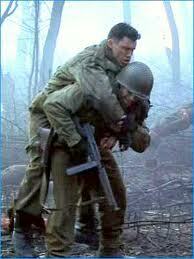 It is a fact that even the most war movie illiterate seems to know Saving Private Ryan or has at least heard of it. One could almost go as far as to talk about a before and after era. Occasionally this can become slightly annoying especially considering that this movie overshadows some very well done other movies that would be talked about, appreciated and mentioned if it wasn’t for mean old Private Ryan. On top of that it led to my worst Popcorn moment ever, something that up to that point in time I wouldn’t even have thought possible and , by the way, was never repeated since. I was on holiday in some southern English town. Salisbury or Bournemouth. At the beginning of the movie I was actually sitting in one of the rows in the middle munching Popcorn. Shamefully I must admit that I was not aware of the nature of the movie that would be shown (How could that happen? Living in Switzerland which I did at the time and am doing again now doesn’t really put you in the position to talk about the latest releases of the film industry. US movies are usually already classics by the time Swiss movie theaters start to show the previews). Fifteen minutes into the beginning of the movie it dawned on me: Popcorn was the least appropriate thing when watching a movie like this. 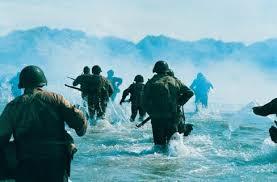 And everybody knows what I’m talking about when referring to the first 15 minutes of Private Ryan. This is probably one of the most hellish moments in the history of war movies (put aside the episode Bastogne in Band of Brothers) and what’s even worse: There is no escaping it. You don’t watch it , you’re literally in it. These 23 minutes are very probably part of its success story. They lead to an extremely close and maybe for some spectators totally unwanted identification with those poor unfortunate soldiers landing on Omaha Beach. A nightmare and absolutely not encouraging popcorn eating. I almost threw up. After having said all this, adorned with some little anecdote of the life of a moviegoer, I’d like to put this straight: I do appreciate Saving Private Ryan. It is one of the best WWII infantry combat movies, no doubt about that, but it is just unfair it gets all the credit when The Thin Red Line is so much more emotional and poetic, and When trumpets fade so much more moving. Ahh… I hear some of you wonder …When trumpets fade… ?What the heck is she talking about?…See? Overshadowed by Saving Private Ryan. 1998. What a year for war movies.